EURUSD gradually formed a short-term bottom, and struggled to reach over 1.4300 last week, followed by a sudden drop to 1.4100 to the end of the week. 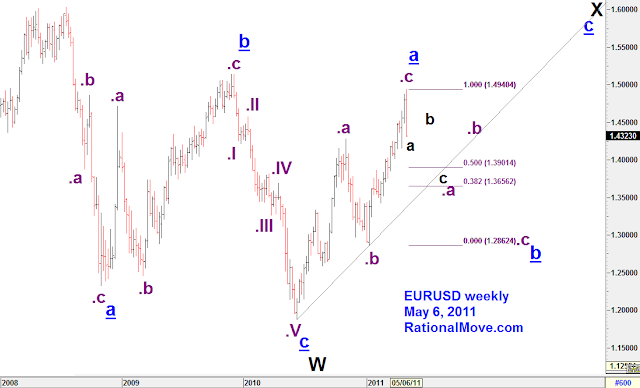 I’m still thinking this is just B of b, meaning EURUSD will try 1.4385 to complete the upward flat wave b. But just in case the rebound had faded already, I set my stop sell order at 1.4038. 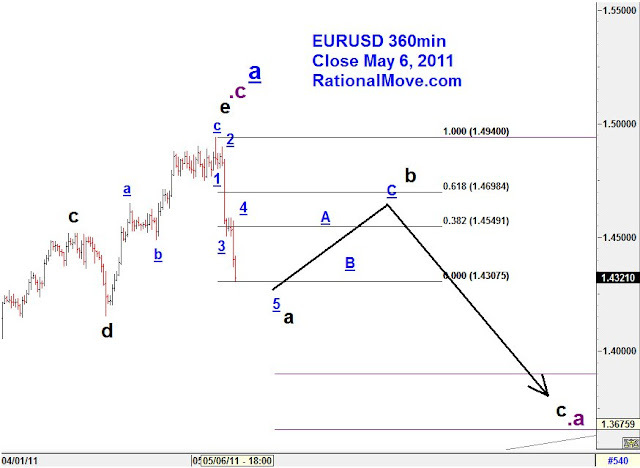 I may cancel this order if I confirm EURUSD is still in wave b.
I give enough time to gold price to swing on the seesaw. There is a good possibility that gold goes down to $1460 level before resuming the rally. The last gold trade ended with a little over 1% profit after seeing as high as 9% unrealized profit. I think the way I pyramided the position was very good. But I clearly missed the ideal time for getting out. If I ask myself now whether or not I should have booked at least a partial profit, the answer is yes. This is only an after-the-fact thought. We often say, “I knew this was going to happen!” No, we didn’t know (at least for sure). Our brains sometimes go as far as to rewrite our own memory. Having said that, this was a good lesson for me to know how the commodity prices behave at the mania. Compared to currencies, the market is very small and the money is hot. So, it wiser to get out while we can even if the price has not reached the target level. What was tricky this time was that I think gold was not in mania, but silver was. I underestimated the effect of the raise of margin requirement on silver to gold positions. I know ECB’s press conference and Osama Bin Laden’s death might have ignited the market movement, but the condition for the correction was there when the margin requirement was raised for the first couple of times. Anyways, I need to thank the fact I left the market with some profit, and that I got some lessons. In general, I think trading from here requires a lot of cautions as I expect the price actions across the different markets to be turning the direction very often. I think I’d prefer taking profit early in this condition. 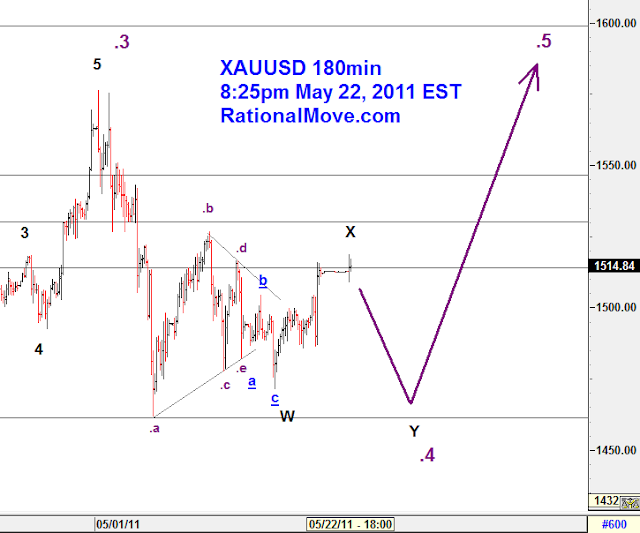 This b is a part of the upward flat wave towards X in my speculation. And b has to come down at least to 1.30 level to be recognized as a dip in this big flat wave of X. Elliott Wave strictly defines that a B wave should be a corrective wave (zigzag, flat, triangle, or complex). In this weekly chart, I assumed b wave to be a flat wave: .a (downward, zigzag as I showed with a-b-c) – .b (upward, corrective) – .c (downward, impulse). One could also speculate b to be a zigzag that is composed of .a (downward, impulse) – .b (upward, corrective) – .c (downward, impulse), and in this case the target for both .a and b will be much lower than what I labeled in the weekly chart. As I was going to be short of EURUSD, I want to be on the conservative side. 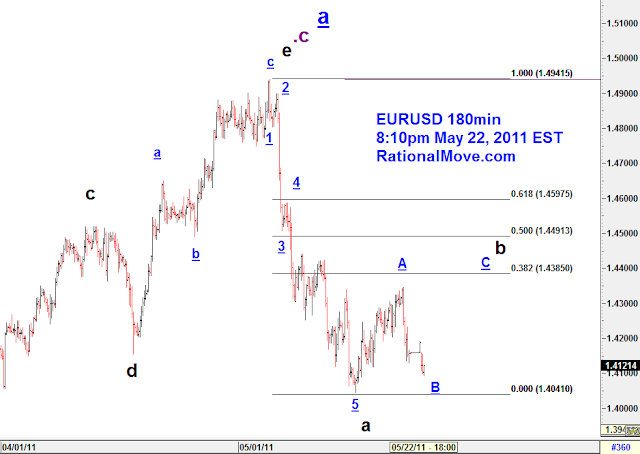 So I pick flat wave scenario, or shallower correction of EURUSD. I know my analysis above is not the easiest thing to understand. Please refer to my introduction to Elliott Wave for the illustration of the main wave shapes. Oh, I wish I could ride on the 600+ pips drop! But my trading span is not that short, so it was not my trade. 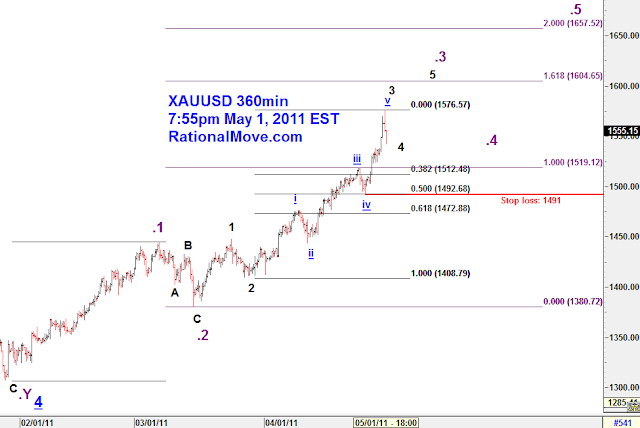 I would wait for a significant rebound to b or 1.4550 ~ 1.47, and that rebound has to be a corrective wave, of course. It’s funny no body except for Indian wedding is buying gold for real use (yes, it’s an exaggeration). But sinking dollar and uncertainties in all over the world driving people buying this useless metal just because it does not stain. Yet when it goes up, anything goes up like smoke. After I saw the initial wave (.1), I immediately thought some crazy acceleration of the price might be following. In terms of Elliott wave, it meant an extended 3rd wave. So, I bought gold at $1446 on March 24, risking about 2.5% of my capital. The price went side-ways for a while, but finally it overcame 1 on April 5, so I bought more, and my average entry became $1450. Again, the total risk was 2+% with the narrowed stop loss level. After a few days pause (and patience), gold never looked back and kept breaking the record. There was no meaningful pullback that one can enter the market…until $1518 (iii). After we saw the quick pullback to $1492 (iv), we confirmed that the FED assured cheap money for the extended period. I bought once again at $1520 when it went higher than the previous high of $1518. I moved my stop loss to the current level ($1491), and this guarantees the profit since the average entry point is now $1473. Now, this is my way of pyramiding the position. I think a pyramiding requires extended rally like this time. Beginning the new week, we are seeing biggest correction down to $1542 after the gold briefly hit $1576. $34 drop is big, and we may see a volatile yet choppy market from here for a while as people start to take profits. But I sit tight here because it perfectly make sense in terms of Elliott wave; this should be the 4th wave correction (4 in the chart), not the market reversal.